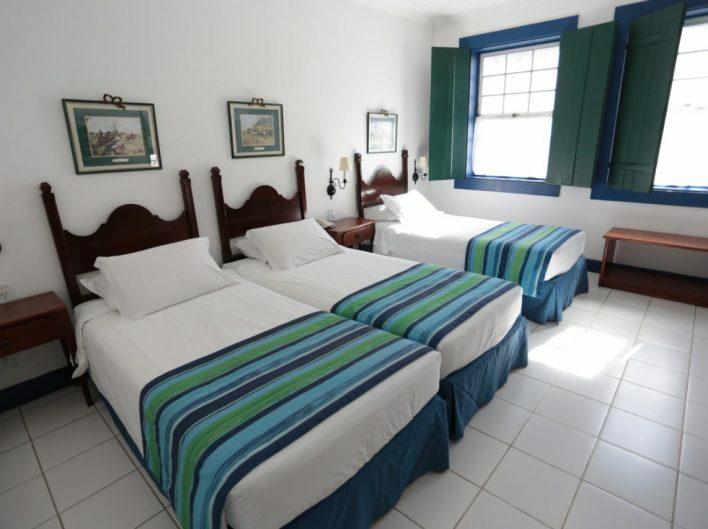 Make your stay the most charming and elegant experience within the colonial atmosphere. The Pousada Porto Imperial has 43 units. Combining comfort and modernity, the Pousada makes a fair and beautiful homage to the Brazilian women’s artistic celebrities (real and fiction). 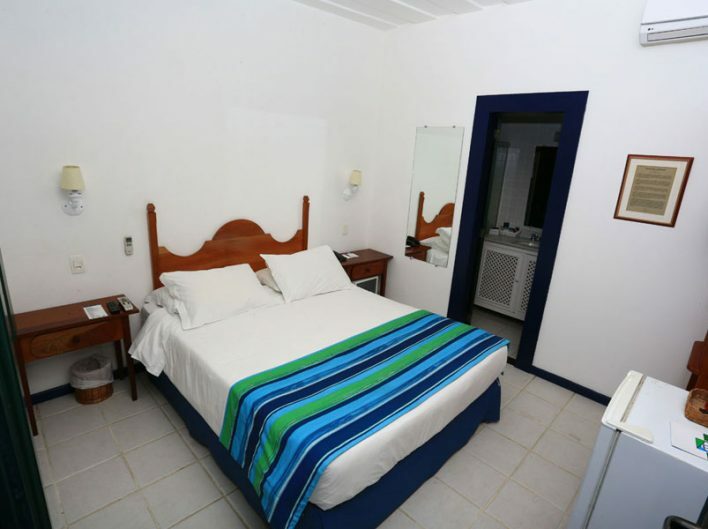 You can stay in Elis Regina, Carmem Miranda, Dina Sfat, Iracema, Leila Diniz, D. Benta, among other personalities. Apartments located on the first or second floor of the lodge, with access by stairs. 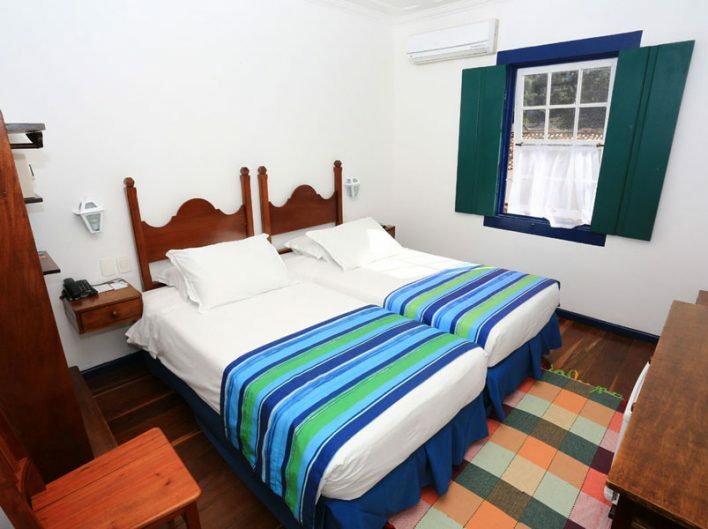 The rooms have 01 double bed or 02 single beds, bathroom, 32″ Lcd tv with Sky HD, electronic safe, telephone, hair dryer, minibar, split air conditioner, open cupboard, dehumidifier and wi-fi. Some apartments have a double bed and and others 02 single beds, which can be pushed together to display a double bed. We do not guarantee conjugated apartments, near or with double bed. Requests are subject to availability upon check-in. The apartments do not have a balcony or a panoramic view. The apartments may suffer minor differences in size and position depending on their location. We do not guarantee location. Apartments located on the first or second floor of the lodge, with access by stairs. They have 01 double bed or 02 single beds, bathroom, 32″ Lcd tv with Sky HD, electronic safe, telephone, hair dryer, minibar, split air conditioner, open cupboard, dehumidifier and wi-fi. Some apartments have a double bed in others the 02 single beds, which can be pushed together to display a double bed. We do not guarantee conjugated apartments, near or with double bed. Requests are subject to availability, at the time of check in. The apartments do not have a balcony or a panoramic view. The apartments may suffer minor differences in size and position depending on their location. We do not guarantee location. Apartments located on the first or second floor of the lodge, with access by stairs. They have 01 double bed or 02 single beds, bathroom, 32″ Lcd tv with Sky HD, electronic safe, telephone, hair dryer, minibar, split air conditioner, open cupboard, dehumidifier and wi-fi. Some apartments have a double bed and others 02 single beds, which can be pushed together to display a double bed. We do not guarantee conjugated apartments, near or with double bed. Requests are subject to availability, at the time of check in. The apartments do not have a balcony or a panoramic view. The apartments may suffer minor differences in size and position depending on their location. We do not guarantee location. Apartments located on the first or second floor of the lodge, with access by stairs. They have 01 double bed or 02 single beds, bathroom, 32″ Lcd tv with Sky HD, electronic safe, telephone, hair dryer, minibar, split air conditioner, open cupboard, dehumidifier and wi-fi. Some apartments have double bed and others the 02 single beds, which can be pushed together to display a double bed. Apartments located on the first or second floor of the lodge, with access by stairs. They have 01 double bed or 03 single beds, bathroom, 32″ Lcd tv with Sky HD, electronic safe, telephone, hairdryer, minibar, split air conditioner, open cupboard, dehumidifier and wi-fi. Some apartments have double beds and others 03 single beds, which can be pushed together to display a double bed. We do not guarantee conjugated apartments, near or with double bed. Requests are subject to availability upon check-in. The apartments do not have a balcony or a panoramic view. The apartments may suffer minor differences in size and position depending on their location. We do not guarantee location. Apartments located on the first or second floor of the lodge, with access by stairs. They have 01 double bed and 02 single beds, 01 bathroom common to both environments, 32″ LCD TV with Sky HD, electronic safe, telephone, hair dryer, minibar, split air conditioner, open cupboard, dehumidifier and wi- fi. Requests are subject to availability upon check-in. The apartments do not have a balcony or a panoramic view. The apartments may suffer minor differences in size and position depending on their location. We do not guarantee location. Suites located on the first or second floor of the lodge, with access by stairs. They have 01 King bed, bathroom, 42″ Lcd TV with Sky HD, electronic safe, telephone, hair dryer, minibar, split air conditioner, open cupboard, dehumidifier and wi-fi. The suite has a single bed for children under 0 to 11 years old. The suites have no balcony or panoramic view. Suites may suffer minor differences in size and position depending on their location. We do not guarantee location.